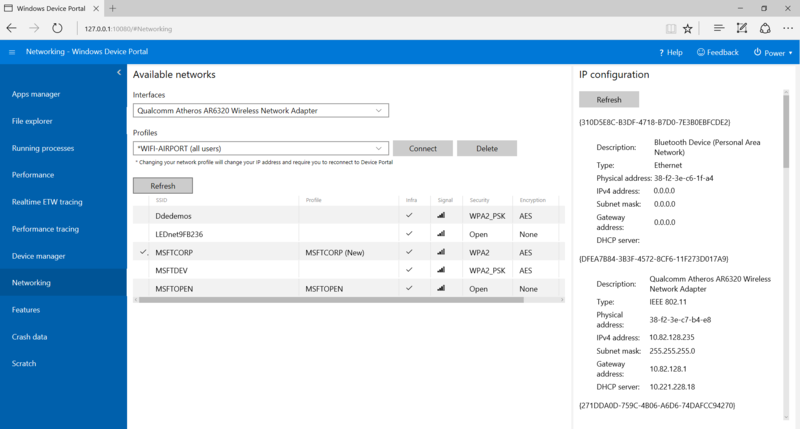 The Windows Device Portal lets you configure and manage your device remotely over a network or USB connection. It also provides advanced diagnostic tools to help you troubleshoot and view the real-time performance of your Windows device. Windows Device Portal is a web server on your device that you can connect to from a web browser on a PC. If your device has a web browser, you can also connect locally with the browser on that device. Windows Device Portal is available on each device family, but features and setup vary based on each device's requirements. This article provides a general description of Device Portal and links to articles with more specific information for each device family. The functionality of the Windows Device Portal is implemented with REST APIs that you can use directly to access data and control your device programmatically. Enable Developer Mode and Device Portal on your device (configured in the Settings app). Connect your device and PC through a local network or with USB. Navigate to the Device Portal page in your browser. This table shows the ports and protocols used by each device family. * This is not always the case, as Device Portal on desktop claims ports in the ephemeral range (>50,000) to prevent collisions with existing port claims on the device. To learn more, see the Port Settings section for desktop. The toolbar at the top of the page provides access to commonly used features. Shutdown: Turns off the device. Restart: Cycles power on the device. Help: Opens the help page. Use the links in the navigation pane along the left side of the page to navigate to the available management and monitoring tools for your device. Tools that are common across device families are described here. Other options might be available depending on the device. For more info, see the specific page for your device type. The Apps manager provides install/uninstall and management functionality for app packages and bundles on the host device. Deploy apps: Deploy packaged apps from local, network, or web hosts and register loose files from network shares. Installed apps: Use the dropdown menu to remove or start apps that are installed on the device. Running apps: Get information about the apps that are currently running and close them as necessary. When you've created an app package, you can remotely install it onto your device. After you build it in Visual Studio, an output folder is generated. 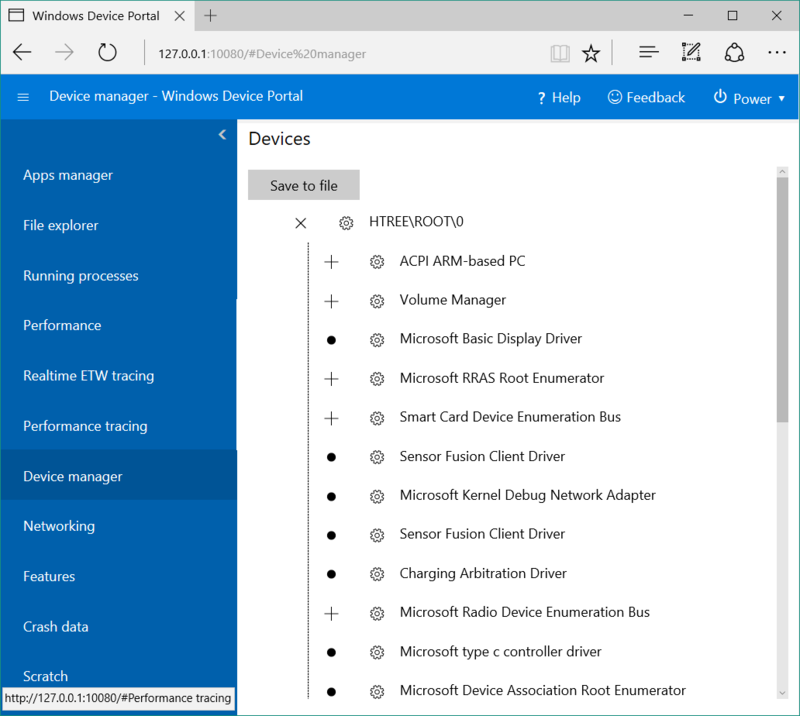 In Windows Device Portal, navigate to the Apps manager page. In the Deploy apps section, select Local Storage. Under Select the application package, select Choose File and browse to the app package that you want to sideload. Under Select certificate file (.cer) used to sign app package, select Choose File and browse to the certificate associated with that app package. Check the respective boxes if you want to install optional or framework packages along with the app installation, and select Next to choose them. Select Install to initiate the installation. If the device is running Windows 10 in S mode, and it is the first time that the given certificate has been installed on the device, restart the device. In the Deploy apps section, select Install Certificate. Under Select certificate file (.cer) used to sign an app package, select Choose File and browse to the certificate associated with the app package that you want to sideload. Ensure that your app is not running. If it is, go to Running apps and close it. If you attempt to uninstall while the app is running, it will cause issues when you attempt to reinstall the app. Select the app from the dropdown and click Remove. This page shows details about processes currently running on the host device. This includes both apps and system processes. On some platforms (Desktop, IoT, and HoloLens), you can terminate processes. This page allows you to view and manipulate files stored by any sideloaded apps. See the Using the App File Explorer blog post to learn more about the File explorer and how to use it. 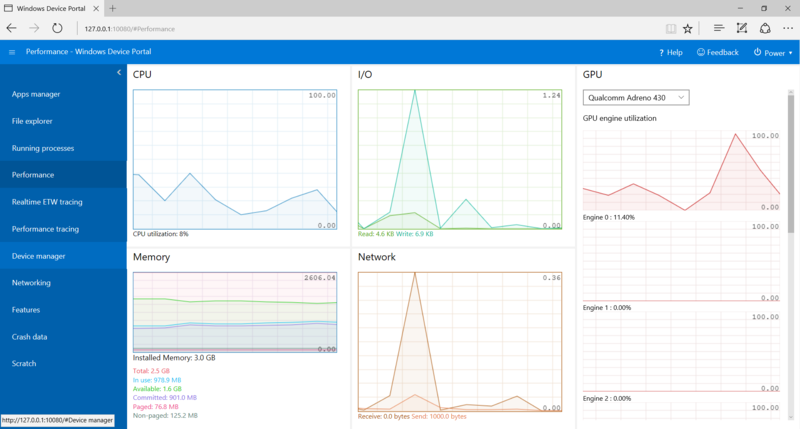 The Performance page shows real-time graphs of system diagnostic info like power usage, frame rate, and CPU load. The ETW logging page manages real-time Event Tracing for Windows (ETW) information on the device. Check Hide providers to show the Events list only. Click or tap Enable to start tracing. The provider is added to the Enabled Providers dropdown. 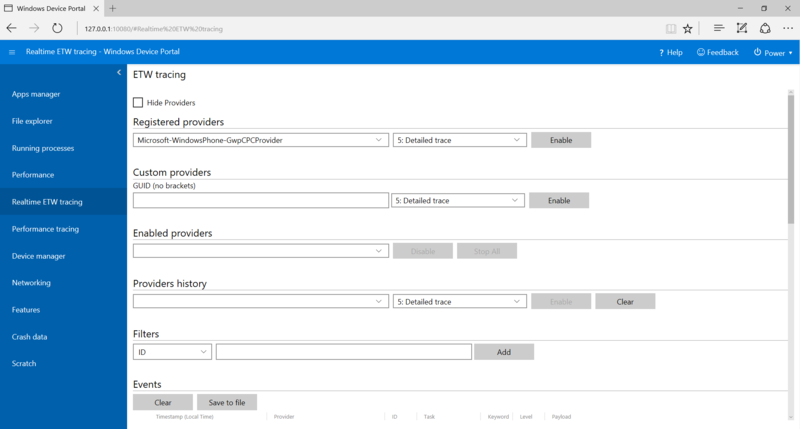 Custom providers: Select a custom ETW provider and the tracing level. Identify the provider by its GUID. Do not include brackets in the GUID. Enabled providers: This lists the enabled providers. Select a provider from the dropdown and click or tap Disable to stop tracing. Click or tap Stop all to suspend all tracing. Providers history: This shows the ETW providers that were enabled during the current session. Click or tap Enable to activate a provider that was disabled. Click or tap Clear to clear the history. Filters / Events: The Events section lists ETW events from the selected providers in table format. The table is updated in real time. Use the Filters menu to set up custom filters for which events will be displayed. Click the Clear button to delete all ETW events from the table. This does not disable any providers. You can click Save to file to export the currently collected ETW events to a local CSV file. For more details on using ETW logging, see the Use Device Portal to view debug logs blog post. 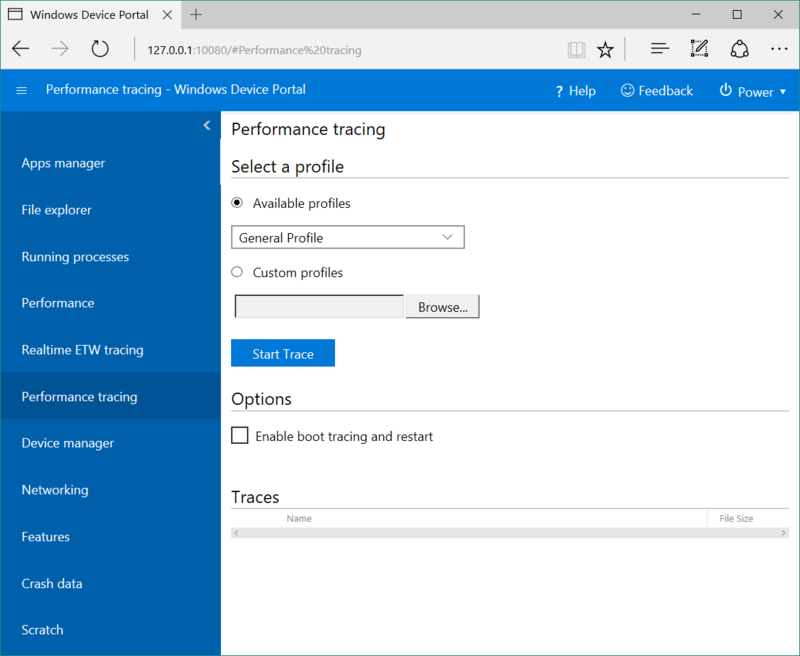 The Performance tracing page allows you for view the Windows Performance Recorder (WPR) traces from the host device. Available profiles: Select the WPR profile from the dropdown, and click or tap Start to start tracing. Custom profiles: Click or tap Browse to choose a WPR profile from your PC. Click or tap Upload and start to start tracing. To stop the trace, click Stop. Stay on this page until the trace file (.ETL) has finished downloading. 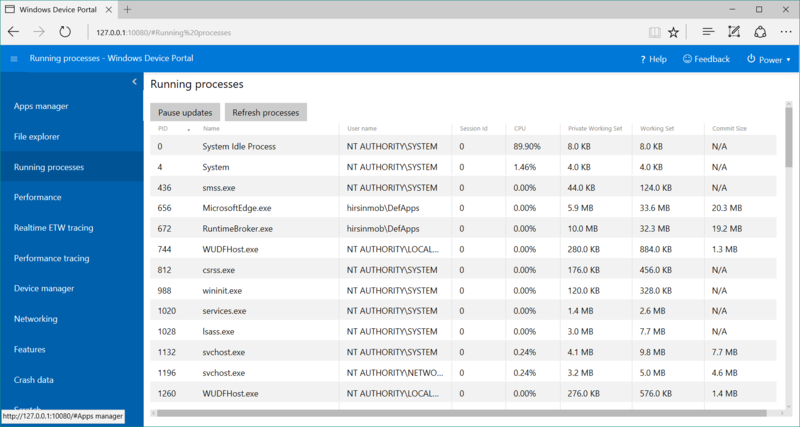 Captured .ETL files can be opened for analysis in the Windows Performance Analyzer. The Device manager page enumerates all peripherals attached to your device. You can click the settings icons to view the properties of each. The Networking page manages network connections on the device. Unless you are connected to Device Portal through USB, changing these settings will likely disconnect you from Device Portal. Available networks: Shows the WiFi networks available to the device. Clicking or tapping on a network will allow you to connect to it and supply a passkey if needed. Device Portal does not yet support Enterprise Authentication. You can also use the Profiles dropdown to attempt to connect to any of the WiFi profiles known to the device. IP configuration: Shows address information about each of the host device's network ports. S int Secure port for Device Portal. If 0 (zero), Device Portal is not listening for HTTPS connections. A string Device architecture. This will be ARM, x86, or AMD64. T null-character delineated list of strings User-applied tags for the device. See the Tags REST API for how to use this. List is double-null terminated. Connecting on the HTTPS port is suggested, as not all devices are listening on the HTTP port advertised by the DNS-SD record. In order to protect against CSRF attacks, a unique token is required on all non-GET requests. This token, the X-CSRF-Token request header, is derived from a session cookie, CSRF-Token. In the Device Portal web UI, the CSRF-Token cookie is copied into the X-CSRF-Token header on each request. Use an "auto-" username. Clients that prepend "auto-" to their username will bypass CSRF protection. It is important that this username not be used to log in to Device Portal through the browser, as it will open up the service to CSRF attacks. Example: If Device Portal's username is "admin", curl -u auto-admin:password <args> should be used to bypass CSRF protection. Implement the cookie-to-header scheme in the client. This requires a GET request to establish the session cookie, and then the inclusion of both the header and the cookie on all subsequent requests. Disable authentication and use HTTP. CSRF protection only applies to HTTPS endpoints, so connections on HTTP endpoints will not need to do either of the above. To protect against CSWSH attacks, all clients opening a WebSocket connection to Device Portal must also provide an Origin header that matches the Host header. This proves to Device Portal that the request comes either from the Device Portal UI or a valid client application. Without the Origin header your request will be rejected.